Ezra Castro was in a hospital room Saturday in Houston, going through more tests, when he heard about Stevie Johnson's proposal. 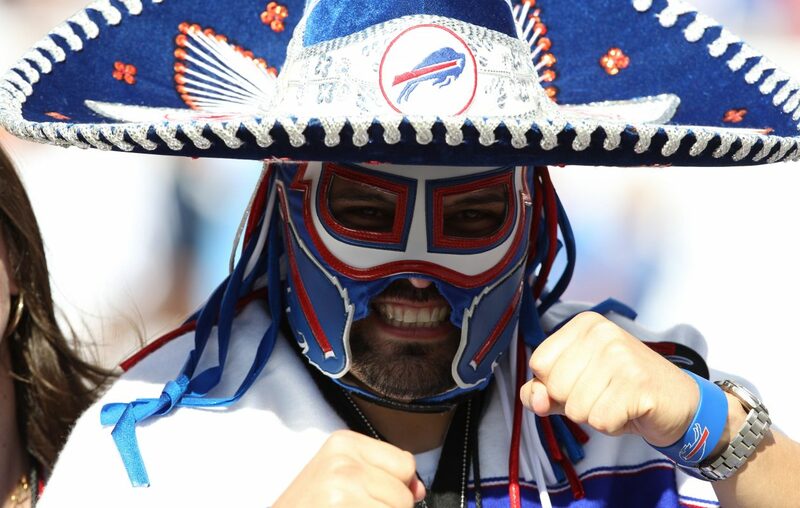 Castro, who is in treatment for stage 4 cancer, is a Dallas mortician who often shows up for Buffalo Bills games in the luchador mask and sombrero of the character he calls "Pancho Billa." Johnson, a former Bills wideout, has been selected by the National Football League to announce the team's third-round draft pick later this month in Nashville. Saturday, Johnson wrote on Twitter that he appreciates the opportunity. Yet he wrote that he wanted to offer the moment instead to Castro, who captured national attention last spring when Fred Jackson and Andre Reed unexpectedly brought him to the stage to call a draft pick for the Bills in Arlington. "He's the heart and soul of #billsmafia," Johnson wrote. Castro was with several close friends, including his companion, Veronica Borjon, at his room in Houston's M.D. Anderson Cancer Center when he heard the news. He was so overwhelmed that he wept, especially as he began receiving a deluge of congratulatory messages. "My phone blew up," said Castro, who described himself as "grateful, just so grateful," toward Johnson. He said he is still feeling a multitude of reactions about the possibility, even before he knows how the Bills or the NFL might respond to the idea. "Right now," he said, "there's a lot to soak in." Castro had planned to be at the draft "incognito," as he put it, simply to join in the excitement with other Bills fans, but he said it is difficult to predict whether his illness will allow that to be possible. After what he describes as 18 months of constant, passionate support from the Bills Mafia, an international network of Bills loyalists, Castro emphasized that it is difficult to fully express his appreciation for the magnitude of Johnson's offer, which he sees as both kind and selfless. Castro noted that many Bills fans have suggested he and Johnson announce the pick together, an idea Castro loves. Whatever happens, he spoke of his awareness that thousands upon thousands of other Bills fans, including many children, are facing cancer and other serious illnesses. If he ends up playing a role in announcing another pick, Castro said, it will be for them.